EDITOR'S NOTE: When Horror Incorporated began in November 1969, it had a pretty consistent start time of Saturdays at midnight. But before long, that start time began slipping -- some weeks it would commence at 12:15, other weeks 12:45. It depended on when its lead-in show finished. But now, and going forward for some weeks, Horror Incorporated will follow The David Frost Show, a 90-minute syndicated interview program, and won't start until 1:30 AM. As you may have guessed, the double-feature format for Horror Incorporated still lies in the future. Many of the movies we are seeing now will eventually become staples of the Horror Incorporated second feature, including tonight's entry, The Strange Case of Dr. Rx. 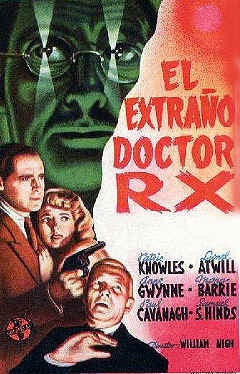 Synopsis: A mysterious vigilante called Dr. Rx is killing mobsters and murderers who escape justice via the jury system. Due to the intervention of this sinister character, acquitted men end up strangled, with notes pinned to their chests signed "Dr. Rx". and bearing a number -- a running tally of his victims. The police have been unable to stop the killings, in spite of elaborate precautions. Detective Jerry Church (Patric Knowles), just returned from South America, gets a lucrative offer from prominent defense attorney Dudley Crispin (Samuel S. Hinds), who is fearful that his own client will be Dr. Rx's next victim. Crispin's offer is "$5,000 to take the case and $5,000 to crack it." This, of course, was real money in 1942; nevertheless, Church turns it down. But after he stumbles upon an intriguing clue, and receives a personal appeal from his old friend, police detective Bill Hurd (Edmund MacDonald), Church decides to take the case after all. Along the way he is reunited with Kit Logan (Anne Gwynne), an old flame, and the two impulsively get married. Church starts receiving death threats, presumably from Dr. Rx, and after seeing how upset Kit is as a result, Crispin reluctantly advises Jerry to drop the case. Church, believing his responsibilities as a married man must take precedence, agrees. But local mobster Ernie Paul (John Gallaudet) wants Church to stay on, and after satisfying himself that Paul isn't Dr. Rx (as the police inexplicably suspect) Church agrees to this too. Due to the careless driving of Shemp Howard (yes, Shemp Howard), Church gets kidnapped by Dr. Rx and taken to his secret lab, where he announces his plan to swap Church's brain with that of a gorilla. Comments: Some of the movies we've seen on Horror Incorporated have been great, and others have been....well, less than great. But The Strange Case of Dr. Rx is our first out-and-out clunker. Its script is pure, inept hackwork. 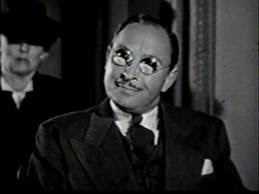 Its best acting talents (Lionel Atwill and Anne Gwynne) are squandered in favor of stuffed-shirt Patric Knowles and his dismal sidekick Mantan Moreland (who is apparently on some horrible work-release program from the Charlie Chan pictures, which were dying a slow death over at Monogram studios at the time). Its attempts at humor are dreary, its horror elements tacked on at the last minute, and its rom-com subplot completely exhausted. As romantic leads, Knowles and Gwynne have about as much screen chemistry as a couple of cinder blocks. The endless appeals to Jerry Church (Take the case! Drop the case! Take the case!) apparently serve no purpose other than padding out the movie's brief running time. The mad-scientist-in-his-laboratory bit is a welcome touch of the macabre, but comes too late to make any real difference and turns out to be what everything else in this picture is: a red herring. Even when we cede that Dr. Rx's entire scheme is idiotic, his plan to swap Jerry's brain with the brain of a gorilla is absurd on its face -- it goes entirely against everything we've seen from him so far. Moreover, the only effect it would likely have on Church would be to make him a better detective. The movie clocks in at a brisk 66 minutes, but it felt like three hours, and by the end of it I was wishing someone would swap my brain with a gorilla's, just so that I could say something interesting happened while I was watching The Strange Case of Dr. Rx. Also, swapping a human's brain for a gorilla's brain is akin to swapping the engine of a '71 Volvo with a '98 Olds Cutlass. Some serious modifications would be needed to pull it off, assuming you could do it at all. Poor Lionel Atwill! At the beginning of 1941, he received top billing over Lon Chaney in MAN MADE MONSTER, then had to settle for second despite starring as THE MAD DOCTOR OF MARKET STREET (below Una Merkel), ending the year second billed again in an insulting cameo in THE STRANGE CASE OF DOCTOR RX (he would soon be listed second again below Lugosi in NIGHT MONSTER). Mantan Moreland was capable of providing more than what the script offered, and elicits a few chuckles despite the "colored valet" role. Better than MYSTERY OF MARIE ROGET, with a nice surprise villain, especially for those familiar with IT'S A WONDERFUL LIFE.